In addition to being pregnant and having that natural urge to get things organized, I took a look around my house a few weeks ago and had an overwhelming feeling of "UGH". You see, we keep our house "tidy". We pick up the toys at the end of the night (most of the time), we clean up spills in the kitchen and do just enough laundry to keep the hampers from overflowing. But every so often that just doesn't cut it. I need CLEAN. The kind of clean that you learn from your mama but spend your entire life avoiding...until you become a mom yourself. And then you get it. So, I sat down on the couch and opened my laptop to create a cleaning list for each and every room. My husband thinks this is counter-productive. He's of the "why don't you just start cleaning instead of wasting time making a list about cleaning" camp. I, however, need to feel focused and organized in order to get started - and a list helps me do just that. My list hangs proudly on the refrigerator just waiting to have the little boxes checked off. Although I've only made it through the first page, seeing the list every day makes me smile and reminds me that I'm just 10 more pages from having a deep-cleaned, organized and put-together house. Which, I do realize that by the time the last box is checked it will probably be time to start back at the first page and work my through it once again. But at least I will be able to see the potential for clean room-by-room if not all at once. 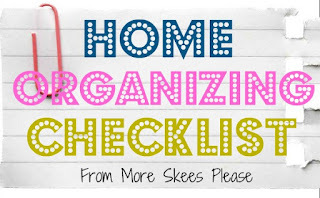 Whether you are pregnant and "nesting" or simply want some inspiration to jump-start your spring cleaning, click on the image below to download your very own customizable Home Organizing Checklist: Room by Room template courtesy of More Skees Please! I'd love to hear how you get yourself prepared for a good deep cleaning of your home. Feel free to leave a comment -- are you a list-maker or a dig-right in and get cleaning type? post the tutorial for wainscotting. i want it in my dining room too. love these printables!